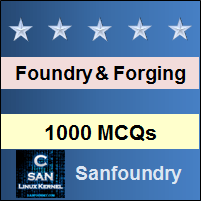 This set of Foundry Multiple Choice Questions & Answers (MCQs) focuses on “Sand Control Tests”. 1. _____________ is used to remove moisture content in the molding sand. Explanation: In the moisture teller, the sand is dried by suspending the sample on a fire metallic screen and allowing hot air to flow through the sample. This method of drying completes the removal of moisture in a matter of minutes. 2. The molding sand is prepared by ______________method. Explanation: The sand Mueller is a device that mixes the sand in appropriate amount. It is subjected to regular rotation with the help of the motor and current. The additional ingredients are added externally. The sand is then supplied by the conveyor belts. 3. High moisture content decreases the permeability of the molding sand and it can be detected by moisture content test. Explanation: The molding sand has moisture as a dominant property. It is defined as the amount of water present in the molding sand. As the low moisture content in the molding sand does not develop strength properties, the high moisture content decreases permeability. 4. The samples of the moisture test are prepared in _______ heater bulb. Explanation: In a foundry testing lab, the samples used for moisture test are 20 to 50 grams of the prepared sand place in the pan and heated by an infrared heater bulb for 2 to 3 minutes. The wavelength of the infrared rays is high enough to generate heat and evaporate the moisture. 5. The top sieve of the sand sieve analysis is the finest. Explanation: In the sand sieve analysis, the sieves are placed one upon the other and shaked so that the finer grains are obtained. They are arranged in descending order from top to bottom and the top most sieves are the coarsest as it has the biggest mesh. Explanation: The grain size, distribution, grain fitness are determined with the help of the fitness testing of moulding sands. The apparatus consists of a number of standard sieves mounted one above the other, on a power-driven shaker. 7. _________ measures air pressure in air permeability test. Explanation: The quantity of air that will pass through a standard specimen of the sand at a particular pressure condition is called the permeability of the sand. This is a major sand control test. Hence, a manometer is used. 8. Which of the following tests are done for molding sand strength? Explanation: Measurements of strength of molding sands carried out on the universal sand strength testing machine. The strength measured such as compression, shear and tension. The sands that could be tested are green sand, dry sand or core sand. The compression and shear test involve the standard cylindrical specimen that was used for the permeability test. 9. The green compression tests of the strength tests required to be very high. Explanation: Green compression strength or simply green strength generally refers to the stress required to rupture the sand specimen under compressive loading. The sand specimen taken out of the specimen tube and immediately (any delay causes the drying of the sample which increases the strength) put on the strength testing machine and the force required to cause the compression failure is determined. The green strength of sands is generally in the range of 30 to 160 KPa. 10. The mould hardness is tested in the same way as the Brinells hardness test. Explanation: A spring loaded steel ball is indented into a standard specimen prepared. The depth of indentation can be directly measured on the scale which shows units. When no penetration occurs, then the hardness of 100 and when it sinks completely, the reading is zero indicating a very soft mould. The same procedure is followed in checking the Brinells hardness number.